The Airless high pressure pumps of the PROFESSIONAL Series are most suitable for applications in paint circulation systems. Due to their high pressure transmission the models 28048, 28064 and 24071 are particularly suitable for highly viscous, low-solvent and solvent-free materials with high solids content. The models 38032, 38042, 44024 and 44032 were especially developed for applications with coarsly pigmented or abrasive materials with low to medium viscosity, such as e.g. zinc primer, solvent based micaceous iron ore, glass flake, printing inks, flame protection and other heavily pigmented or fibrous materials. Due to the high displacement a slow piston movement is assured even when working with large nozzle bores, and the wear is correspondingly low. 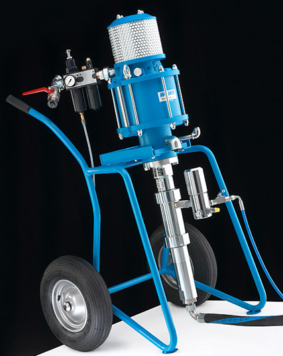 This makes the units particularly suitable for use in automatic spray painting systems, with or without circulation.